According to Facebook(s fb), police and other agencies in the US asked for user data on more than 11,000 occasions during the first half of 2013, a number that included more than 20,000 individual Facebook users. The numbers come by way of the social network’s first Transparency Report, a document that also lists figures for other countries around the world, though U.S. requests are by far the highest. Facebook did not hand over information in every case. 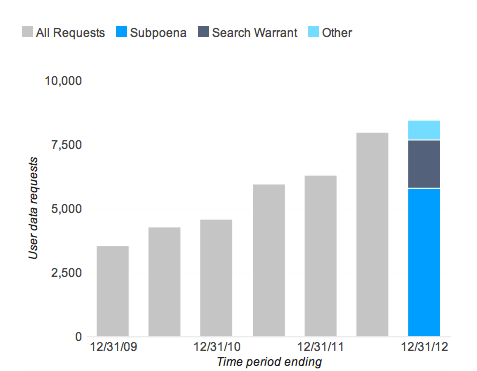 The 11,000 US data requests are more than the approximately 8,000 requests received by Google(s goog) for a similar time frame. According to Facebook, many of the requests were for criminal matters like robbery and kidnappings. The category breakdown is important in part because of the growing media attention on the federal government’s surveillance programs. Currently, Google is reporting the number of national security letters as a range, but is unable to say anything about so-called FISA letters — secret court orders that are nominally used to spy on foreigners but that many fear also target Americans. Google and Microsoft(s msft) are now locked in a largely secret battle with the secret spy court for the right to publicize FISA information. Facebook’s inaugural Transparency Report puts it in the company of Google, Twitter and other tech firms that are now publishing reports about data requests on a regular basis. Indian gov also raised around 5,000 request! !